Each year in the spring, typically between Ostara and Beltane, gardens begin to bloom, and one of the first flowers we see is the tulip. 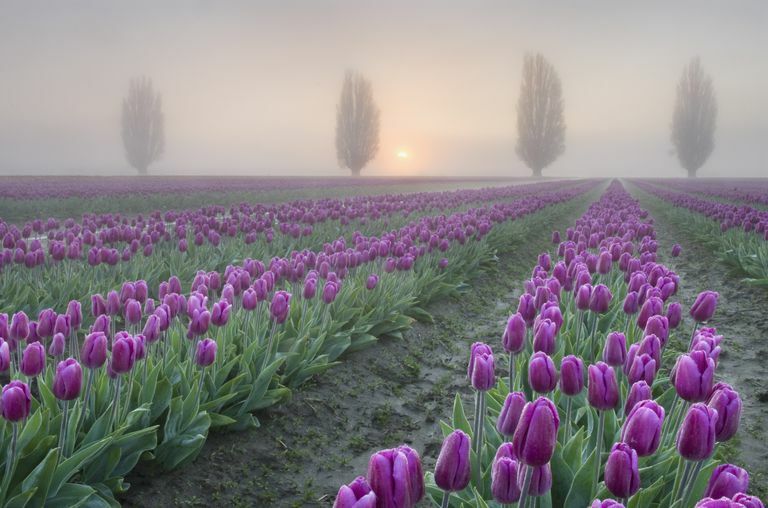 Although it is typically connected to prosperity, the tulip appears in so many different colors and varieties that it becomes a very handy magical tool. Consider the flexibility of color magic–use a dark strain such as Queen of the Night for full moon rituals, white for forgiveness spells, or bright red flowers for love magic! Let’s take a look at the history and folklore behind the tulip, and figure out some ways to use it in magical workings. The tulip was first discovered in Turkey around a thousand years ago, and its origin story is reminiscent of Romeo and Juliet. In Turkish legend, there were once two star-crossed lovers, a princess named Shirin, and Farhad, a stonemason. Shirin’s father opposed the love match–because one cannot allow a princess to marry a lowly tradesman–and so he ordered Farhad to complete a complex task. While the stonemason was off doing as he was told, Shirin’s father sent the young man a message saying that the princess was dead. Overcome by grief, Farhad took his own life. Of course, once Shirin heard this news, she ran off to find him. Upon discovering his body, she too killed herself, and as their blood pooled together, it formed the tulip. Interestingly, in Turkey, the word for tulip is the same as the word for turban, and it is considered a charm against evil. Eventually, through trade routes, the tulip made its way to Holland, where it became the national flower, and is associated with good luck and fortune, as well as love. Because tulips have a number of different magical associations–plus they’re available in so many colors–you can use them for a vast array of magical purposes. Planting the bulbs around your home in the fall will give you a goodly collection of tulips to use in the spring, so it’s not a bad idea to put in a bunch of different varieties. This will give you a lot of different magical options once they begin to bloom. Because of the wide variety of tulip colors that are available to use, there a number of different magical aspects that can be incorporated. Try to find some of these specific strains and colors to use in magical workings. Queen of the Night: This tulip variety is a deep purple, so dark that it’s often mistaken for black. Use it in full moon rituals, for workings related to power and ambition, or even for banishing spells. Princess Irene: This standard tulip variety appears primarily in shades of orange and red. Use the red flowers for workings related to love magic. Orange is associated with attraction and encouragement, so if there’s someone or something you want to draw into your life–perhaps to encourage affections–use the petals and stems of the orange Irenes. Leen Van Der Mark: Available in yellows and reds. Plant yellow ones near your front door and under windowsills to protect your home and its inhabitants from those who would cause harm. Pim Fortuyn Triumph: This white tulip comes in handy for any sort of rituals having to do with purity or cleansing. Place cut Pims in vases around your house each spring, to bring a fresh and clean feeling to your entire home as part of your spring-cleaning process. Daffodil: This flower is associated with love and fertility–place fresh ones in your home to bring about abundance. Dandelion: To bring positive change about, plant dandelions in the northwest corner of your property. Use the bright yellow flowers in divination, or in a sachet to draw good energy your way. Forsythia: Associated with anticipation, you can combine forsythia with tulips if you’re waiting for love that hasn’t yet arrived. Lily: The Easter lily or Tiger lily is associated with all kinds of spring connections such as fertility, rebirth, renewal and abundance. Violet: The violet is associated with tranquility, peace, and protection from evil. Carry the petals with you to bring about luck and enhance nighttime magic. It's Spring, Which Means it's Time for Daffodils!